On arrival at Bagdogra airport or Siliguri (NJP) railway station meet our representative, who will assist you to board your vehicle to Gangtok (5500 Ft /1677 Mts, 130 Kms / 04 to 05 Hrs) & give you briefing about your tour .After leaving Siliguri we drive along the NH 31A through the dense forests Mahananda Wild Life Sanctuary, the natural play ground of wild elephant, tiger and deer. 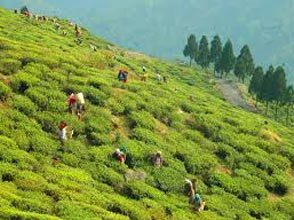 Sevok comes next with its promises for the gorgeous view of Tista river as it comes out from the deep gorge of the Himalayas and spreads itself in the vast plains on North Bengal. 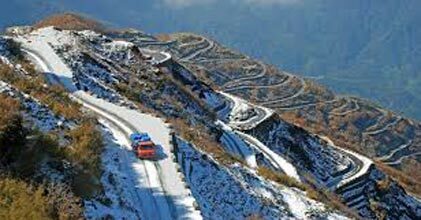 From Tista Bazaar follows the winding roads and a picturesque drive through Himalayan hills to Gangtok , the capital of Sikkim. Check into hotel and get refreshed for a free leisure evening. Recommend to roam in MG road around the Mall to enjoy the typical Hill City life of Gangtok and enjoy a comfortable overnight stay in hotel. After our breakfast we will proceed for local sightseeing in or around Gangtok including Tashi view point, Ganesh Tok, Hanuman Tok. These viewpoints offering panoramic view of snow capped Himalayan peaks & Gangtok city. Proceed to visit Rumtek Monastery/ Jhakri Falls , Institute of Tibetology to have a glance of Tibetan antics, Orchid House ( Collection of Himalayan orchids), Enchay Monastery ,Dodurl Chorten etc. In the evening visit to M G Marg, the busy market of Gangtok, for shopping and having Sikkimese delicacy at the local restaurant. After breakfast drive for a memorable excursion tour to Tsomgo Lake (12,400 ft. /39 km), one of the highest altitudes Himalayan Lake. This beautiful oval shape lake almost 1 km long with its average depth 50 ft is situated in east Sikkim Himalaya. From here we will drive further 15 km to Baba Mandir. One can further drive to Nathula pass (12,000ft.) 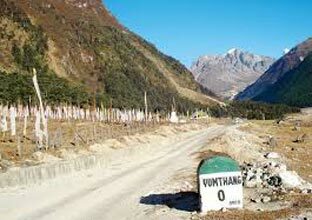 towards china border depending upon the accessibility of the route. We will back to Gangtok by late afternoon. Evening is free for roaming around M.G Marg, the popular Shopping area in Gangtok. After breakfast embark for Pelling (7,000 ft. /134 km/6 hours) in West Sikkim . 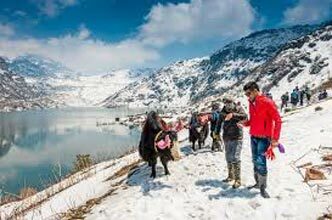 It is famous for its spectacular view of eastern Himalayan range i.e Khangchendzonga, Pandim, Kumbhakarna, Rathong, Zopuno, Shimbho, Narsing, Sinolchu. The first phase of the journey rolls along the picturesque valley of River Tista till Melli and then it runs along the beautiful valley of Rangit till Legship. We will take a refreshing break at the view point near Melli and watch the magnificent bird eye view of the confluence of both the rivers. From Legship the road takes a steep turn through Geyzing. The view of the entire surrounding widens as you proceed towards Pelling through the clouds and forests. Later enjoy a comfortable overnight stay in the hotel. We start our sightseeing tour with Pemayangtse Monastery - one of the premier monasteries in the State. 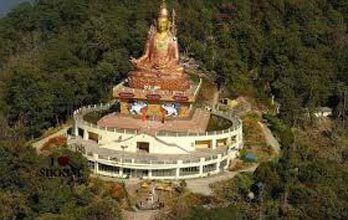 Originally established by Lhatsun Chempo, one of the revered Lamas to have performed the consecration ceremony of the first Chogyal of Sikkim. The most astounding feature of the monastery is a painted wooden structure of Zantho Pelri – the Heavenly Palace of Guru Rinpoche. 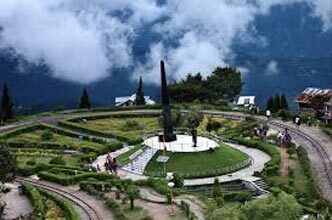 It os located on a hill top at an altitude of 6840 ft. commands a magnificent panoramic view of the Himalayan ranges and the surrounding hills and country-side. From here we will proceed to the legendary Kechopalri Lake, it is one of the holy Buddhist lake and it is believed that any wish in front of the lake comes true - Myth is that when a leaf falls on the placid clear water surface, it is picked by a bird and thus the water surface is always free of leaves. On the way we will also visit Kunchenjungha Falls and Rimbi Falls two magnificent perennial waterfalls of the state .After lunch at Peeling we drive for a hour to Dentham Valley and visit Tsangey Falls . 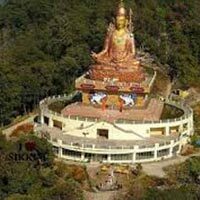 Also visit Sinsore Bridge – the highest bridge in Sikkim. Back to Pelling in the afternoon and have a relaxed evening watching the sunset over the Mighty Khangchendzonga from your Hotel. Evening free to roam around the helipad or Shopping centre . After completing a farewell party drive back to Siliguri (NJP)/ Bagdogra (IXB) via same route for your onward journey with happy memories to cherish .